Modern Automated External Defibrillators (AED’s) are becoming more common, are straightforward to use and save lives. This qualification is designed for individual to use AED’s confidently and competently. Topics include; basic life support, primary survey, dealing with collapse, CPR, AED function, AED procedure [adult/child], lots of practice safely using an AED, roles, responsibilities and reporting. Typical delivery methods are predominantly practical and the qualification is assessed by tutor observation of candidate performance. Tutor contact time of 4 hours. 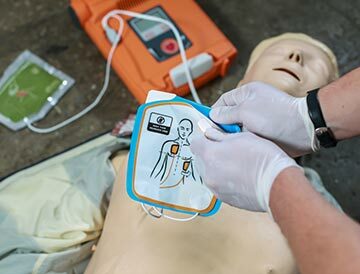 Successful completion will result in the candidate gaining the qualification certificate ‘ITC Level 2 Award in Basic Life Support and Safe Use of an Automated External Defibrillator’. The qualification is revalidated by attending another qualification training course after 3 years – it is recommended that candidates attend annual refresher training.